I have just baked this delicious bread for the third time and I am finally content with the results. I really love the feel of big breads, so I chose to make a 2 kg loaf. Making such a big bread is a joy for me also because it always means that I'm gonna make some other people happy with little tasty presents. I had some problems in the past with underproofing this bread, mainly because my old fridge is playing tricks on me. I am never quite sure that the temperature inside it will remain constant. This time, the day I prepared the bread, it was pretty hot outside and the temperature inside the fridge was around 11-12 degrees (often it stays around 5-6 degrees). So I chose to take the loaf out of the fridge after seven hours of proofing and left it at room temperature another 30 minutes before baking it. I don't know if I could have achieved larger wholes in the crumb, I am still not very good at diagnosing an underproofed bread, unless it's really underproofed as in very very dense. All in all, the bread tastes and feels very good, it has a pretty light texture and the aroma given by the combined seeds is a delight. I wish you all happy baking and beautiful summer days! P.S. : I am submitting this bread to YeastSpotting. Nice baking and beautiful crust and crumb. Looks perfect and tastes fantastic I'll bet. Your statment that you "really love the feel of big breads" made me smile. I've never read anyone say that here before, but, me too! I think I was inspired by Émile Friant's Les Canotiers de la Meurthe (as was Chad Robertson, which is why he placed it at the beginning of his Tartine Bread). So my weekly (semi-weekly, during the summer :-) bakes are routinely two 1.5-2 kg boules, one naturally levaned mostly white, the other yeasted mostly whole grain. More efficient use of our small oven too of course. Hamelman's 1500 gr formulas work nicely. But 2 kg - those go a long way! When I bake anything smaller now, they look like dinner rolls! Hi, Tom! I didn't know this picture before. The bread in it looks so wonderful and those people so happy, there's a beautiful atmosphere in there, thanks for sharing. I don't have "Tartine Bread" yet, it will definitely be the next book I buy though. I keep finding signs everywhere on the internet that make me so curious about it. Till now the only serious bread book I got is Hamelman's one. In the last three months I've baked so many recipes from there and learned a lot because of it, but I begin to feel how I will soon need another angle to the story of bread. It's nice to hear that you are also baking big breads. I myself don't really know why I like them, but maybe the feeling is connected to the past somehow. Making the first miche was definitely a close to mystical experience for me, because I felt I repeated this ancient custom so many people had as part of their daily reality. I think that back then bread meant much more than now because it was such an important part of the diet. I also find interesting the fact that the baking of these wonderful breads was not a leisure activity, but a neccessity, people had to bake in order to have bread. And they had to bake breads big enough to last until the oven would be kindled again. This aspect of "the bread that lasts" is an important drive for me in my search for better breads. That is why I am crazy about sourdough I think. I like to detach myself and observe how I slowly and gradually shift my view upon bread. The more I bake it, the more it becomes to me a food I can count on, not only because it can be so much more nourishing than I was used to before, but also because it doesn't go bad so fast. My breads can feed people for days and days and this feels so good. I do wonder how would it feel to cut into a 3-4 or 6 kg loaf! Oh my, the power of such a loaf! I hope I'll be able to do it once. I could have written most of what you've said -- my sentiments precisely. The is a certain romance and spirituality about making bread, and the effect is palpably amplified when a big loaf comes out of the oven. For me (and you and many others I assume) at least, I think it connects us with (our certainly naive conception of) simpler, purer times, much the same as contemplating images left to us by Émile Friant and Jean-François Millet. I yearn to taste the bread the man is cutting in Friant's image (and smell that salt sea air, taste the wine, hear the women laugh), as much as I'd like to taste those pictured here @ TFL :-). I wonder if we'd actually like Friant's bread at all. It would certainly have varied week-to-week, loaf-to-loaf depending on who mixed and kneaded it, the weather, the oven's fire and age of stored flour, its milling etc. Too much salt? Too little? But that idea of a communal oven from which 3-6 kg loaves were weekly (or bi-weekly) birthed -- has a certain romance, can't deny it. Hendrickx Belgian bakery in Chicago produces at 4+ kg loaves of a very satisfying white flour, yeast fermented bread. Maybe they're bigger than 4 kg -- not sure. We've bought only half loaf at a time. A full loaf (at $37!) would make quite a statement on a communal table. As for Tartine Bread, Robertson's narrative of his personal bread journey is full of bread romance, moreso than the seemingly required 'my bread journey' that prefaces so many bread books (except Hamelman, interestingly enough). 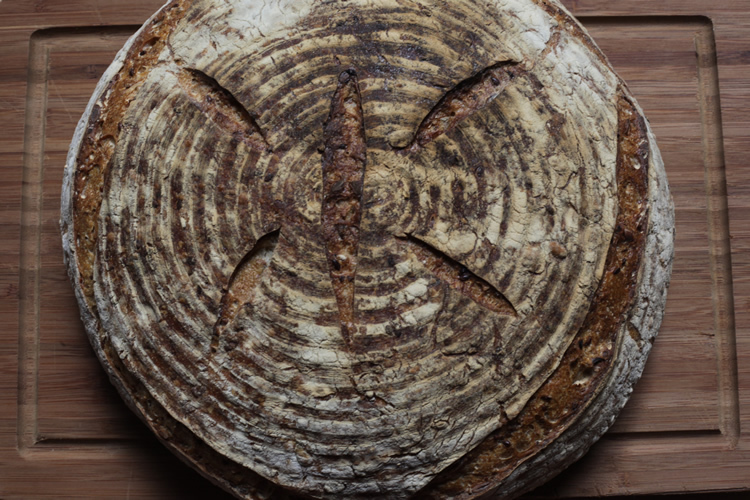 But if you've worked through many of Hamelman's Chapter 5 Levain Breads, then Robertson's basic Country Boule won't be a major revelation and might be a frustration (as it was, but -- I'm relieved to report -- no longer is, for me). Compared to Hamelman's SD breads, it's a longer process (~9 h vs. 5-6 h) because <10% of the formula's flour is prefermented and possibly diabolically higher hydration (more trouble for some than for others, it seems). There's much more than just that formula in the book, but it's the cornerstone. That said, it's hands-down the most beautiful bread book anyone's ever published (that I've seen, at least). Superb photos, art, binding. Your bread looks like something I'd definitely love to eat! I have the toasted sunflower and sesame seeds for this bread cooling as I write. I love it, and yours looks just as I like it - boldly baked. If you like this bread, you will also like the 5-grain sourdough that precedes it in "Bread." If you make it, don't skip the overnight retardation. It makes a world of difference. You have baked a beautiful loaf of bread. I too prefer baking the larger 2 kilo (4.4 lb.) loaves. FWIW. 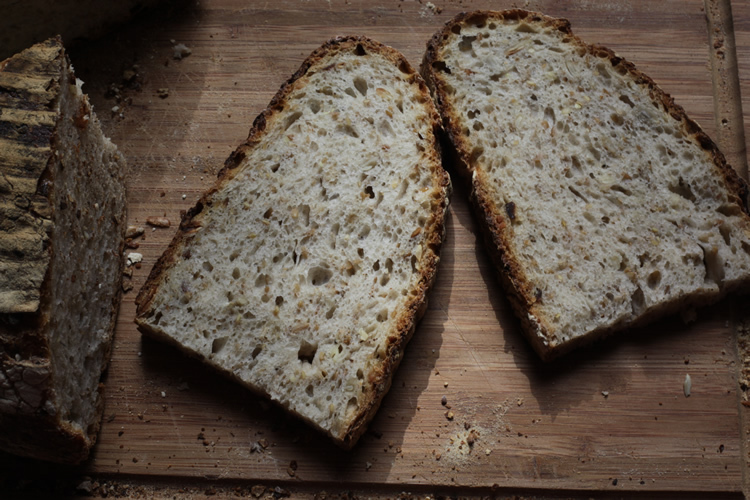 I have found that there are a number of factors that affect the openness of the crumb in the larger loaves: hydration level, handling of the final dough during shaping, the amount of soaker introduced into the dough, and the sheer size of the loaves. I don't think you can go wrong using Hamelman's formulas. As David said, the overnight retardation adds a good amount of flavor to the bread. Here's a link to Chad Robertson's technique which may be helpful. Andreea C's Recent Blog Entries. Does sourdough make enriched sweet breads better?